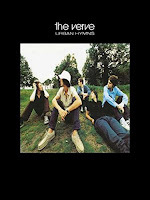 In 1997, there were three monumental British albums that caught the imagination of fans on both sides of the Atlantic. While Radiohead (on their way to becoming one of the world's biggest bands) released the career-making OK Computer and Spiritualized put out the groundbreaking Ladies and Gentlemen We Are Floating in Space, The Verve took angsty lyrics, their own much improved songwriting from Richard Ashcroft, and Funkadelic/CAN-like fuzz and repetition to the top of the U.K. charts and made a significant dent in the American charts as well on the back of songs like Bitter Sweet Symphony. The song, with its prominent (and unfortunately for them, notoriously costly) string sample from an orchestral version of The Rolling Stones' "The Last Time," remains both a U.K. standard and a touchstone for those of us here in America looking to the U.K. for music better than the dull post-grunge being pushed by so-called "alternative" radio. But what of the rest of Urban Hymns? The Drugs Don't Work is arguably even better and songs like The Rolling People, Weeping Willow, and Velvet Morning mix Britpop, psychedelia, dreampop, and anthemic, U2-like stadium rock to dizzyingly great effect. This Time is a moment of self-affirmation while Catching the Butterfly and Neon Wilderness retained the band's more experimental tendencies from their earlier work (such as 1993's debut album A Storm in Heaven). 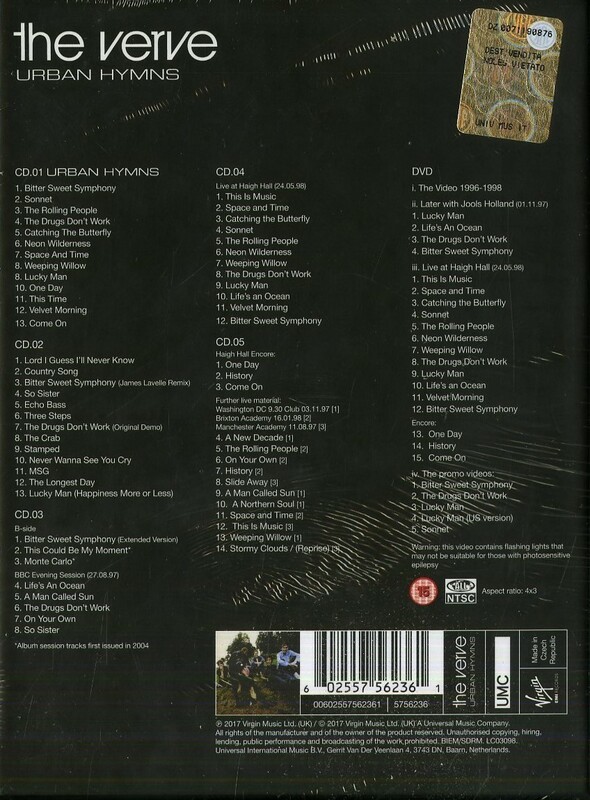 Twenty years on, Urban Hymns is still a classic. It is presented here on disc one, while disc two contains the album's B-sides (previously released on singles and EPs) and several remixes. 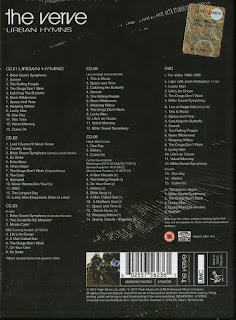 Disc three consists mostly of a six-song BBC Evening Session recorded near the album's release date, though only The Drugs Don't Work is played from the album. Still, like the live material found on discs four and five (from Haigh Hall, the 9:30 Club in Washington, D.C., Brixton Academy, and Manchester Academy), it shows not only their prowess as a live band, but their renewed confidence as well. 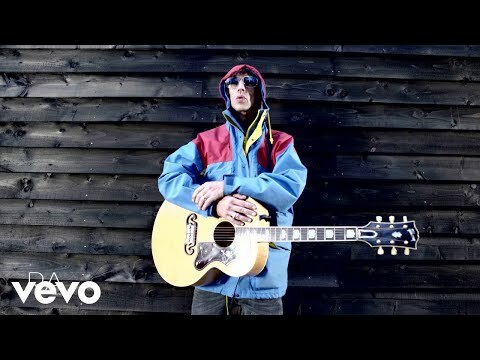 Buoyed by their then-recent success, Ashcroft introduces Bitter Sweet Symphony (the last song of the main set at Haigh Hall) as a "song of the people" while defiantly claiming that it was "stolen, but not by us." Material from older albums, like the 9:30 Club version of title track on their sophomore album A Northern Soul, is also revisited here as well. As if that wasn't enough, there's also a DVD consisting of an appearance on iconic British late night music show Later... with Jools Holland, the full Haigh Hall performance (including encore), and the promotional videos, several of which received quite a bit of airplay on MTV when they were originally released. As with most such box sets, this is an exhaustive, comprehensive, and occasionally exhausting listen given its sheer scope and volume. Furthermore, it could be argued that most fans would just be satisfied with the original version, especially as there are no truly previously unreleased bonus tracks on here (diehard fans likely already own the B-sides and remixes). However, for those who dig deep and want it all, one can't really argue with the quality of most of the music here. This is The Verve at their very finest and while the album would go on to influence mostly inferior versions of this combination of styles, it was never done better than it was here.